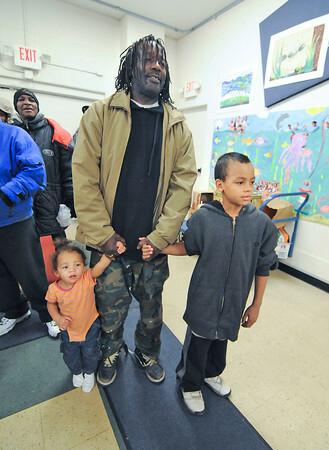 James Neiss/staff photographerNiagara Falls, NY - Sister and brother Nina Anthony, 2, left, and Jamel Johnson, 8, right, hold hands with their father Jimmie Anthony in line for a free lunch at Heart & Soul. The Ontario Avenue soup kitchen is having it's Annual Recognition Dinner on Thursday, April 25 from 5:30 p.m. The two children share the same birthday March 29.